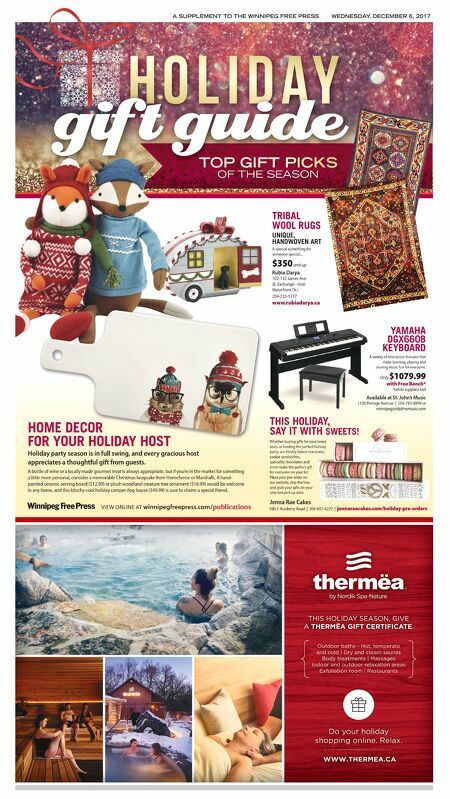 A SUPPLEMENT TO THE WINNIPEG FREE PRESS WEDNESDAY, DECEMBER 6, 2017 TOP GIFT PICKS OF THE SEASON VIEW ONLINE AT winnipegfreepress.com/publications YAMAHA DGX660B KEYBOARD A variety of interactive features that make learning, playing and sharing music fun for everyone. Only $1079.99 with Free Bench* *while supplies last Available at St. John's Music 1330 Portage Avenue | 204-783-8899 or winnipeg@stjohnsmusic.com Rubia Darya 102-132 James Ave. (E. Exchange– near Waterfront Dr.) 204-223-5177 www.rubiadarya.ca TRIBAL WOOL RUGS UNIQUE, HANDWOVEN ART A special something for someone special... $350 and up 580-E Academy Road | 204-691-4222 | jennaraecakes.com/holiday-pre-orders Whether buying gifts for your loved ones, or hosting the perfect holiday party, our freshly baked macarons, cookie sandwiches, speciality chocolates and more make the perfect gift for everyone on your list. Place your pre-order on our website, skip the line, and grab your gifts on your selected pick up date. THIS HOLIDAY, SAY IT WITH SWEETS! Jenna Rae Cakes HOME DECOR FOR YOUR HOLIDAY HOST Holiday party season is in full swing, and every gracious host appreciates a thoughtful gift from guests. A bottle of wine or a locally made gourmet treat is always appropriate, but if you're in the market for something a little more personal, consider a memorable Christmas keepsake from HomeSense or Marshalls. A hand- painted ceramic serving board ($12.99) or plush woodland creature tree ornament ($16.99) would be welcome in any home, and this kitschy-cool holiday camper dog house ($49.99) is sure to charm a special friend.